This Bank Holiday Monday will kick off what is expected to be a milder week for most of the country. Today will be misty and cloudy with scattered outbreaks of rain. Dry spells are to develop later in the afternoon with temperatures reaching 7 to 10 degrees. The mist will continue tonight with scattered rain and temperatures dropping as low as 3 degrees. Tomorrow will see highs of 11 to 15 degrees with sunny spells in the afternoon after a misty, damp morning. The mild weather will continue on Wednesday which will be a dry day with highs of 13 to 15 degrees. Thursday will be dry in most parts of the country with some spells of rain possibly developing in the northwest. 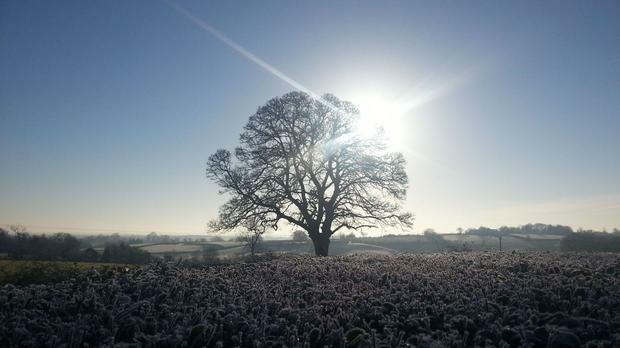 It’s set to cool down towards the end of the week, with frost expected for Friday night and lows of 1 to 3 degrees. The weekend will be mostly dry with sunny spells and highs of 8 to 11 degrees. However, it’s due turn cold overnight. Met Éireann warned of icy patches and hard frost as temperatures are expected drop to zero or below.